Product Description: The Raymond Weil Story Since its founding by its namesake in 1976, Raymond Weil draws inspiration from major musical works to create elegant and cutting-edge timepieces. Named after the Wagner opera, the signature Parsifal collection balances symmetry and harmony with a powerful, valiant outlook befitting of the opera's hero. The Don Giovanni collection, named after Mozart's comedic opera, blends daring design with advanced technical prowess, and the Don Giovanni Cosi Grande mechanical chronograph is hand assembled by Raymond Weil's finest watchmakers. Over the years, Raymond Weil has introduced a number of other series that helped the company become an enigmatic leader of the Swiss watch industry, including the Othello, with its discreet design that emphasizes strength of character and uncompromising beauty, and the sophisticated, color-stained-crystal Traviata. Based in Geneva, Switzerland, Raymond Weil watches are manufactured entirely in the Swiss watchmaking universe. The company's signature motto--"Independence is a state of mind"--is a reminder of its desire to conceive timepieces that are different, elegant and modern, while at the same time displaying all the rigor of watchmaking excellence. Product Description: Stainless steel case with a stainless steel bracelet. Fixed bezel. White dial with luminous, silver- tone hands and Roman numeral hour markers. Minute markers around the outer rim. Luminescent hands and dial markers. Date displays at the 3 o'clock position. Quartz movement. Scratch resistant sapphire crystal. Case diameter: 39mm. Case thickness: 75 mm. Secured deployment clasp with double push button. Water resistant at 50 meters / 165 feet. Functions: hours, minutes, seconds, calendar. 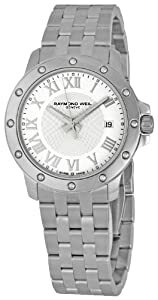 Raymond Weil Tango Men's Watch 5599-ST-00308.